Certified Divers enjoy our small groups and personal service! Antic port to hide away from stormy weather, our bay is protected from the wind. On our dive spots waters are calm even during bad weather and offer good diving conditions. 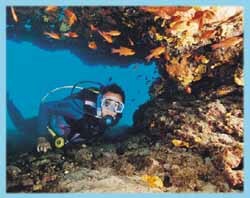 We can also arrange dive-safaris to undiscovered places in Crete like to the south coast of Rethimnon and to the far end of the east coast. These tours are on request and a minimum participation is required. If you have a diving license (BSAC, PADI, NAUI, CMAS, etc.) 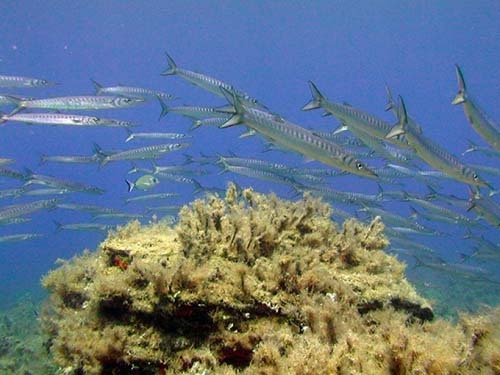 we offer you various interesting and exciting dives in the North of the island. Most of our dives (where underwater life such as groupers, eels, octopus and box fish abound) are from the shore where refreshment is available straight after the dive. With us you can enjoy and relax during your dive. Because of the variety of sites, we provide you with an experienced member of our team, showing you our beautiful bay and the surrounding areas. The depth varies between 0 and 40 m reachable from the beach or the boat, offering the best supposition for all level of divers. Every certified diver is asked to bring his diving license and logbook with him. In case this is not possible, it is on the discretion of the divebase/instructor to ask for a check-up dive before leaving with the group of certified divers. We offer a complete curriculum for different levels of diving education. It starts with the first step, an introduction like Discover Scuba Diving program, up to the first professional certification. All the courses can be given in different languages i.e. French, German, Dutch, English, and Greek. Add this unforgettable experience to your holidays!